*Book provided by NetGalley in exchange for an honest review. 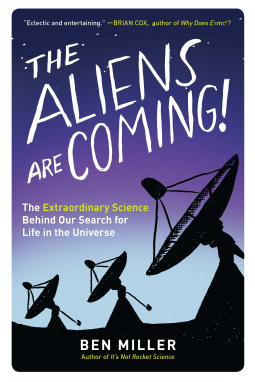 In this book, Ben Miller looks at the search for extra-terrestrial life through a scientific lens. By breaking down the Drake Equation and examining all the requirements of it from a physical, biological, geological, mathematical and even linguistic perspective, Miller gives us a realistic picture of the likelihood of communicating with aliens. At the same time, he uses terrestrial examples to show areas we still need more information on. If you enjoy science, this is actually a good book for you. There is little conspiracy theory and hypothetical talk and a significant amount of science. Admittedly, I struggled through the biology of evolution section (used to give a time template for how long it may take life on other planets to become complex) but the rest of the book was an engaging, intelligent read. Miller's humor also helped to balance out some of the drier parts. I greatly appreciated that this search for extra-terrestrials reminded the reader that there are plenty of things we can learn from our own world to aid our search. The convergent evolution that leads to platypi. The translation of dolphin language. The ripple effects in our understanding of the world from each discovery we make about it. There were so many parts of this book that led me to eagerly do some quick Google searches to get a better understanding. This is something that I think all good science books should do. They should light a fire of curiosity in the reader, a need for more information. Did you think about picking the best Bitcoin exchange company: YoBit. Invest in Ripple on eToro the World's Top Social Trading Network! Join millions who have already found better strategies for investing in Ripple.